Tomorrow is Tuesday (22nd Dec), it’s also the Chinese Dōngzhì Festival (冬至), or you called it in more proper English term as Winter Solstice Festival. This festival is important to most Chinese, as it represents the growth of another year of wisdom with bountiful harvest. Last year, we made our own rice balls and cooked it into dessert soup dish for the festive. And this year, I am not going to make my own rice balls, but to get the readily types of rice balls in the market. In fact, these kinds of convenient packs are available to most major supermarkets in Singapore all-year-long. You can simply buy and cook it anytime you want. Well, this is the Chinese ritual to have rice balls (pronouced as: Tang Yuan, 汤圆) in Dongzhi Festival, not just celebarating the growth, but to also symbolise the reunion of family (团圆) and the round shaped rice balls refers to the hope of having a perfect result in anything we do (圆满). I yearned for a difference in making this traditional festive food. There are already many different delicious ways of having the rice balls desserts done interestingly in the market. They are no longer just having the rice balls in ginger soup, but have it in peanut soup, in “Dou Hua” (sweet beancurd dessert), with grassjelly and even go with chocolate dippings! So, how can I not be a little more adventurous this time since I was on my ‘own time, own pace‘ basis (chuckling). As you know, I am a big fan of sweet potatoes, and in fact, I was having this soup the other night as my ‘dinner meal’. So, I created this sweetness treat and hoping to cook it again for this upcoming Dongzhi festive, if the combination works well! 12 – 15 balls of Tang Yuan aka Glutinous Rice Balls (汤圆), with choices of filling: black sesame, red bean, yam and mashed peanut. *My favourite: the mashed peanut filling. 1) Boil a pot of water over high heat. Place ginger into the boiling water. Add sweet potatoes into the pot and bring it to another boil. 2) Reduce heat to low fire. Add in ginger, red dates and sago. Simmer the soup till sweet potatoes are softened, for about 20 minutes. 3) Add in rock sugar and simmer for another 10 minutes. When rock sugar is completely dissolved, increase heat to medium-high fire to bring the soup to a boil. 4) Place frozen rice balls into the boiling broth. Then, reduce heat again to low fire and let simmer till all rice balls rise to the surface of the broth. Heat off and serve hot. 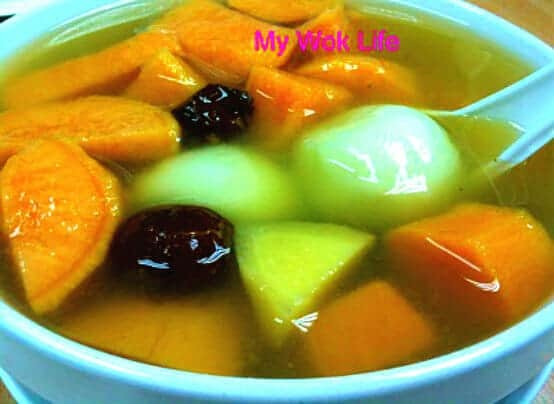 Well, you still can make your own homemade glutinous rice balls with sweetened ginger soup (see recipe), and cook it this way. Tell you something, there are also beliefs in Chinese culture that one has to take the amount of rice balls according to one’s age, simply means, if you are 30 years old, please take 30 balls (laughing)!! So… if you are making your own rice ball, make it tiny! With the ingredients used in this recipe, you may actually cook this during Chinese New Year as one of the auspicious food items. A bowl of my sweet dessert soup with 2 chunky peanut glutinous rice balls counts about 350kcal. Tips: Do not thaw the readily-packed frozen glutinous rice balls before cook.